This is the conceptual picture of the year, a monumental logistic achievement to film an independent narrative feature film within the confines of Walt Disney World, undercover of the notoriously watchful eyes of its brand police, and actually have it distributed. While spotty in execution and performance the films hits a bull’s-eye as a parable to the soul sucking sensation of parenting. 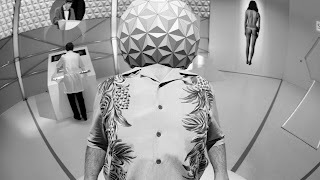 Jim (Abramsohn) is a sad sack, an emasculated father of two, on vacation in the Disney World, introduced getting fired over the phone by his boss. Jim is a victim of ruthless American capitalism but forces himself to suppress his emotions, hide his anger from his domineering wife Emily and ‘enjoy his vacation’ in the most American of places. Director Randy Moore then depicts Jim and company navigating their way through Epcot Center, queuing up for hours for the rides, dining in the culturally inert ‘World Showcase’ attractions and other spoon fed forms of entertainment. At one point while Ben is taking a breather from his energetic children he sits on a bench to have a ‘turkey leg’ as a snack, until he’s informed by another patron it’s not actually from a turkey but an emu. Thus nothing is what it seems in Disney World, and nothing is what it seems for Jim. Jim’s delirium state takes over, leaving his kids unattended, not answering the cell phone calls from his wife, and instead ogling a pair of Parisian girls who cocktease him like Sirens onto the rocky shore. Jim pathetically chases the girls through his inner childhood, getting drunk at Germany world and even sleeping with another sexually adventurous single mother. Moore’s tone gradually moves from Jim’s emotional disenchantment to an overt dive into Lynchian surrealism. At one point he’s even kidnapped an experimented upon by a representative of the Siemens company in the middle of the Epcot geodesic dome. Moore at times startles us with horrific imagery, but mostly Jim’s journey is a hypnotic dream state where reality merges with fantasy with no seeming exit to escape. Moore’s choice to present the film in black and white seems a natural choice. Sucking the colour out Disney World leaves us with a strangely grotesque point of view into the revered characters we know so well. That said the film is marred by spotty performances by the leads including an inconsistent Roy Abramsohn and Elena Schuber. Technical challenges such as marrying authentic Disney-locales with obvious special effects and green screened scenes jump out at us. The narrative consciously deceives us with an oblique ending meant to tease us with more questions than provide answers. Moore admirably leaves Walt Disney mostly untouched refusing to nail the low hanging fruit. Instead he positions the film a parable to the dehumanizing role of parenting, causing Jim to sacrifice his manhood and conform to a modular role in child-rearing. As Jim becomes disembodied with his old emasculated self, in the end he becomes a new Jim, blossoming within his inner Freudian Id.